Get ready to bust out the BBQ, because its finally grill season. Mmm, I can practically taste the sizzle of tender steaks and juicy ribs, waiting to be devoured. Nothing says spring is here like a backyard BBQ. Best enjoyed with your friends and family over burgers, sausages and Canadian Cheese. 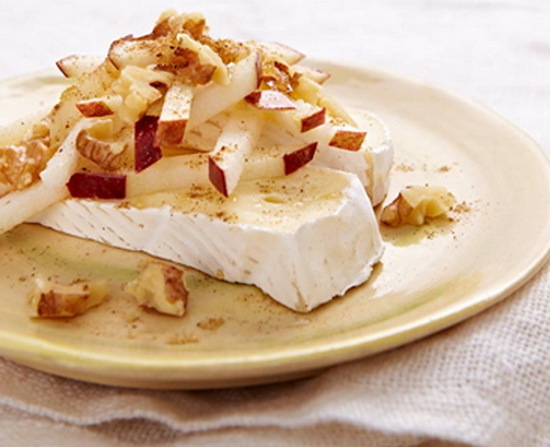 Just don’t forget to leave room for dessert, or a scrumptious snack, like Spiced Apple with Canadian Brie. This light snack is sure to be a hit with its simple ingredients locally sourced from the farm. Slice up some apples with a dash of allspice, brown sugar, and a drizzle of lemon over thick wedges of creamy Canadian Brie for a bite of pure pleasure. Savour your snack with a sweet Icewine from local Niagara winery Peller Estates. The 2012 Peller Estates Oak Aged Vidal Icewine offers fresh fruity notes of white peach, mandarin orange and white flowers. It plays with your taste buds with seductive hints of nutmeg and vanilla that pairs well with spiced apples and delectable Brie cheeses. A true pleasure at any table. Pour lemon juice into a bowl. Place cut apples immediately into bowl and coat with lemon juice to prevent browning. Put slices of Brie on a plate. Top with apples and sprinkle with brown sugar, spices and walnuts.